Jazzgene wrote: Great album. My friend mastered this one! It's almost a crime that the music on these LP's lay unpublished for decades. I probably should say it is a crime that this music was unpublished for decades!!! Yes. The perils of the business of music goes deep. Currently listening to a 45rpm 180g reissue of Coltrane on Impulse. I protest! It is completely unfair to post about a 45 rpm, 180g reissue of a Coltrane, Impulse release, without FULL details, AND if it is available to the proletariat. PS. Lucky You! I wish it was me! This is the album. My favorite Coltrane. Double LP 45rpm 180g. Jazzgene posted this LP by John Coltrane which is the 200 gram, 45 RPM 2 LP release. I have a 180 gram 33 RPM, single LP release, so the hunt was on. Jazzgene was kind enough to point me in the right direction, but of course, it was out of stock, so I've placed my order, and I'm on the waiting list for whenever new stock arrives. As I'm sure all of you know, speed and vinyl weight do effect overall record quality. Who knows how long I must wait. I did find one for sale via the internet, but the seller was asking double the already very premium price, so that was a non starter. Incredible sound and performance on this live album recoded in a small NYC LES cafe in 1993. Really is like you are in the cafe with them, you hear everything (including the hum of his guitar amp, a lot!). This is now one of my best-sounding albums. Perfect pressing too. Highly recommended! Edit: I uploaded this photo on my phone and it was straight. Very frustrating that it is rotated on a desktop machine. Last edited by gene9p on Tue Jan 15, 2019 10:38 am, edited 1 time in total. 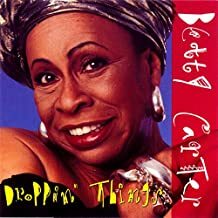 Betty Carter LP "Droppin' Things"
Betty Carter, Recorded live at The Bottom Line in New York City, many years ago, as usual, doing her thing, singing with a group of outstanding musicians, including Freddie Hubbard, - Trumpet, Geri Allen,- Piano, Craig Handy, - Tenor Saxophone, and others.